If you suffer from chronic joint or muscle pain or are recovering from an injury, far-infrared heat can help you. Conventional heating pads and wraps heat only the epidermal (outer) layers of the skin, penetrating up to 3mm (3/25 of an inch). 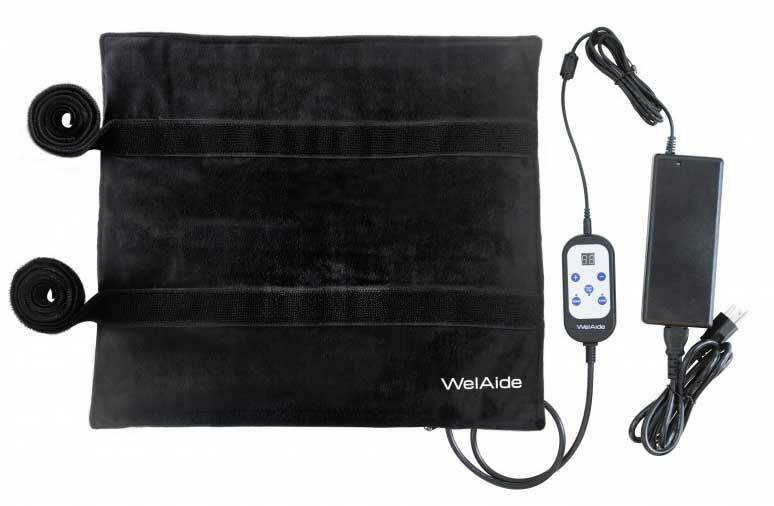 The WelAide Wrap with carbon-fiber wiring emits infrared heat, which penetrates deeply into joints, muscles and tendons (at least two inches). Blood flow increases to the affected area for faster healing and pain relief. This type of heat is also warm enough to feel soothing, but not so hot that you can overheat or burn yourself. This soft, flexible pad has no jade pieces and is lighter than the regular infrared pads. It can be folded and placed anywhere on the body. Hold it flat, lie on it, or roll it around your arm or leg. Adjustable digital remote with six heat settings and auto-off timer. Removable, washable velvet cover; long cable for ease of movement (12.5 feet); two 36-inch Velcro straps. Measures 15.5" x 17.5". Comes with carry bag. Click here for more information on negative ions. Click here for a WelAide brochure. Click here for an informational video on infrared heat, by Dr. Len Saputo. Do not use this product if you are pregnant, are a hemophiliac, have open wounds or skin lesions, or have implanted silicon, silicon prostheses or metal implants. If you have any medical condition, consult your healthcare practitioner before using this product. There is a restocking fee of 15 percent on WelAide wraps that are returned.